Texas has intrastate rival Texas A&M and Oklahoma has Oklahoma State. But to Texas fans, their only true rivals are the Oklahoma Sooners and the same can be said for the Sooners. The annual tussle between these two great football teams is known far and wide as the Red River Rivalry. First played in 1900, the showdown between the Longhorns and Sooners has become one of college football's best and most bitter rivalries. Though the Texas-Oklahoma series officially began in 1900, the game truly arrived in 1929—the year it was first played at the neutral-site city of Dallas. The city is located about halfway between Norman, Oklahoma (home of the Sooners) and Austin, Texas (home of the Longhorns). The storied Cotton Bowl stadium has played host to the game since 1937. Gameday is always scheduled in early October, during the Texas State Fair. It typically falls on the second Saturday of the month. Because it's a neutral stadium, the seating is split in half. Texas fans fill on one side of the 50-yard-line and Sooners fans are on the other. The scene is similar to the one that plays out each year in Jacksonville, Florida, where Florida battles Georgia in another classic neutral-site rivalry. The good news is that the Red River Rivalry figures to remain in Dallas for years to come. In 2014, Oklahoma, Texas, and the City of Dallas came to an agreement that would keep the game in the city at least through 2025. The Red River Rivalry gets its name from—what else?—the Red River, which separates the states of Texas and Oklahoma. For decades, the game was called The Red River Shootout, but starting in 2005, the name was officially changed to the SBC Red River Rivalry. 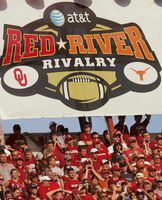 The next year, it was changed once more, to the AT&T Red River Rivalry. No matter what it’s called,this much is certain: the game is always a knock-down, drag-out affair between two schools that truly don't like each other. The series has been made especially bitter because of the fact that, dating back to Oklahoma's Bud Wilkinson glory days in the 1950s, much of the Sooners’ top talent has been recruited out of Texas. As former Oklahoma coach Barry Switzer once told USA Today: "No game carries with it the atmosphere, the excitement, the energy level that the Oklahoma-Texas game does. When you hit the floor of the Cotton Bowl, there's electricity. And if you don't feel it, you ought to have your saliva checked." The winner of the Red River Rivalry takes home not just one, but three different trophies. The oldest is the Golden Hat, a bronzed ten-gallon hat, which is given to the athletic department of the winning school. The Red River Rivalry trophy, first created in 2003, is given to the student government of the winning school. The Governor’s Trophy is exchanged by the governors of each state. The Red River Rivalry has become especially heated in recent years, as both Oklahoma and Texas have placed themselves among the nation’s elite. The game has played a major role in determining not only the eventual Big 12 Conference Champion but the national champion as well. Oklahoma won the national championship in 2000 while Texas brought it home in 2005. The Sooners have dominated the series of late, posting a few blowouts over Texas in the process. In 2012, they won 63-21 and in 2011 the score was 55-17, yet the 65-13 win in 2003 remains one of the most notable. Texas is not without its glory, though. Overall in the series, the Longhorns dominate in the win category. After the 2016 game, the all-time stats stand at 61-45-5 so the Sooners need to keep their wins going for a decade or more if they hope to catch up. In the minds of Sooners fans, the tight 2001 game—won by the Sooners, 14-3—was the best in recent memory. A classic defensive struggle saw both defenses hold the opposing offenses to less than 100 yards rushing. Oklahoma missed two field goals while Texas had one blocked. Holding a 7-3 lead late, the Sooners caught a big break when Texas was forced to start a drive from its own 3-yard-line. On first down, All-American Sooners safety Roy Williams blitzed Texas quarterback Chris Simms. He leaped over the Texas offensive line, deflected Simms’ pass, and knocked it right into the hands of Teddy Lehman, who walked into the end zone. Lehman’s touchdown put the Sooners up 14-3 and the game was instantly out of reach. Williams’ blitz is simply called 'The Play' by some Sooners fans. It is one of the most memorable moments in Oklahoma's long and storied football history. Prior to a 2007 contract that extended the game location through 2015, the schools had complained about the sorry state of the Cotton Bowl. They had even publicly contemplated making the rivalry into a traditional home-and-home affair. In 2008, a massive renovation took place that increased the Cotton Bowl's seating capacity to 92,000. Everything in the stadium - from the seats and the press box to the scoreboard, lighting, and concessions - was either replaced or upgraded to the tune of $50 million. Since then, the fans and teams have been more than happy to make their annual pilgrimage to the stadium.